Inspiring recollections of Jonathan Paley Wolman, editor and publisher of The Detroit News since 2007, flow online after his death Monday from complications of pancreatic cancer. Newsroom folks often try to appear crusty rather than sensitive. They can be more brash or brusque than emotionally effusive. But when a respected figure who's one of their own passes, talk gets poignant and passionate. This 68-year-old newsman is recalled as "a calming influence," "incredibly kind" and "a decent human being." "Jon Wolman was a hell of a newspaperman," writes Nolan Finley, editorial page editor throughout his boss' time in Detroit. He pulled out every budget trick he could find to minimize layoffs. . . . He pushed us to find creative ways to do more with less. He championed hard news coverage and investigative reporting and took great pride in keeping The Detroit News among the best regional newspapers in the country. "He challenged his reporters and editors to question conventional wisdom and to distrust our own assumptions," Ron Fournier, a past Associated Press colleague, writes in a guest column for The News. "He was a great teacher . . . [and] a great leader. . . . I wish you had known him." He was "such a steady and calming hand on the wheel amid the constantly chaotic news scene," tweets former News reporter Paul Egan, now a Lansing correspondent for the Free Press. Oralandar Brand-Williams, in her 26th year as a News reporter, salutes Wolman as "among the great bosses I’ve had in my career. [He] rewarded hard work and talent." A similar sentiment comes from Chad Livengood, who reported for the paper from the state capital from 2012-16. "Jon Wolman was a reporter's editor, always looking out for his troops," tweets the senior reporter at Crain's Detroit Business. "He gave me an incredible opportunity to shine . . . and I will forever be grateful for his keen eye for news, steady hand during turbulent times and his endearing humanity." Wolman's funeral is at 11 a.m. Wednesday in Temple Beth El, 7400 Telegraph Rd. in Bloomfield Township. Among survivors are his wife of 40 years, Deborah Lamm, and their three children: Jacob, Emma and Sophia. The family also includes siblings Natalie Wolman, Ruth Henderson and Lewis Wolman, and the late Jane Wolman. The Ira Kaufman Chapel, handling arrangements, lists three memorial gift recipients suggested by the family. The first, fittingly, is the Committee to Protect Journalists, 330 7th Ave., New York, NY 10001 (cpj.org). 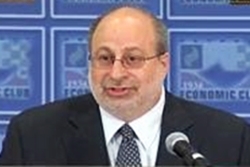 Jon Wolman in 2009 on C-Span. No paper of The Detroit News' size has had such a commitment to Washington journalism as Jon Wolman's Detroit News." -- David Shepardson, 1995-2015 News reporter now at Thomspon Reuters in Washington, D.C.